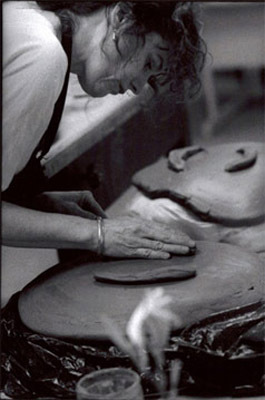 Katherine Sandnas is an internationally-recognized ceramic artist. An impressive yet reserved woman, she is a remarkable blend of cross-cultural and historical experiences. Integrity and purpose guide Katherine in all her endeavors, whether she’s creating artwork, digging in her garden, teaching a class, or preparing a meal. Born in Minnesota in the early 1950s, she began her relationship with the visual arts at an early age, experimenting in many mediums. She later began working with clay, establishing a steadfast commitment as a ceramic artist and educator. Her education began at Hibbing Community College with William Goodman, a mentor and powerful influence. Goodman received his MFA at the University of Wisconsin-Madison; ceramics is one of his specialties. Katherine completed her bachelor’s degree at the University of Minnesota, Duluth. During graduate school at the University of Wisconsin-Superior, Katherine studied Japanese art, visiting master potters, ancient firing sites, museums, and galleries during a study visit to Japan. 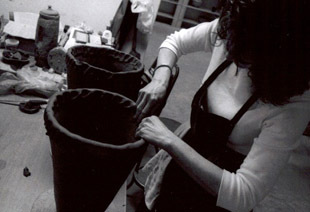 Later, she returned to Japan for an artist residency at the Shigaraki Ceramic Cultural Park, where she studied, worked, and exhibited. This reconnection with Japanese culture strengthened her convictions and directed her life and work. When she returned to the United States, she received a fellowship to work and study with Richard Bresnahan, legendary teacher/potter, who studied with the Nakazato family in Japan. Katherine synthesized cross-cultural, prehistoric influences into an artistic expression that continues to grow. Primitive figures and platters are her signature pieces. Her works are glaze-free in an almost casual manner both primal and organic in nature. Her work utilizes subdued and earthy colors. Her powerful sculptural works are alluring female figures. Katherine’s devotion to the human condition, in particular the female form, is a study devoted to the sacredness, beauty, mystery, and calming effects of the human form. The incredible body of work Katherine has created, includes two and three-dimensional work in bronze and iron. Her works are exhibited in American and Asian museums and institutions. A unique blend of cultural and historical influences are evident in Katherine’s approach to life, clay, and teaching. Anyone reflecting on her work recognizes that she is at peace with self, totally committed to her work, and at one with her medium. This quiet unity of artist and material is a rare and powerful vision to behold. Katherine enriches and inspires the lives of her students and fellow artists. Through her work, she encourages them to live with greater commitment and to listen, learn, and create through life’s lessons. An educator who has worked and studied in a variety of cultural settings, she believes the real testament of her accomplishment as an artist and teacher is in the lives she has touched.